Services – artvera Bilderrahmen – Enjoy your picture! The company began its activities in 2002 under the name Fotokunst24 with frame online shop www.RahmenShop24.de. Over the years, many other online shops and a stationary shop for frames have been added. With the name change to artvera GmbH & Co. KG we focused on the claim “Enjoy your picture!” which caracterises our mission in our specifique field quite well. We run approx. 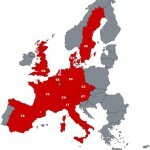 30 online shops in several European countries. We are specialized since ten years on frames and their accessories. We distribute nearly all known manufacturer. artvera GmbH & Co. KG co-invented in 2002 (then under the name fotokunst24.de e.K.) the online trade of frames and developed it since then. The big frame offer is avaible in nearly all colours, formats and variations for good prices and delivery times, since we let the articles deliver directly from the manufacturers. This is the only way for the customers to get the biggest possible selection of frames, in special formats, too. We offer frames on our different online shops but also on platforms such as Amazon and Ebay. 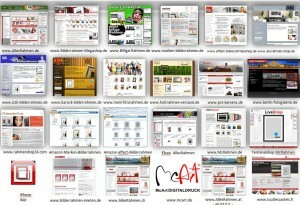 With McRahmen.de, Artvera has realized a completely new concept for the frame retailer. So far, such an innovative business idea in the frame industry did not yet exist. For customers, the convenience of ordering an Internet connects with a shopping trip in a real store. 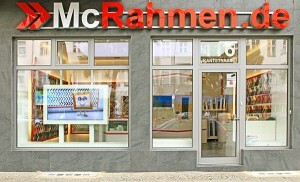 On September 3, 2010, the first McRahmen branch was officially opened at the Kantstraße in Berlin-Charlottenburg. If you enter the shop, you immediately notice the frame samples on the walls. There are up to 1,200. Customers can choose the right frame. They just walk to the wall, find the type of frame that suits them the most and go to the sales counter. There, the angle is scanned and immediately the customer can specify the desired size and design of the frame. In addition, it is possible to select the right frame glass. In order to get a better idea of his picture motif in the frame, the pictures can be displayed on the big screen in the frame of your choice. The images can be brought in digital form on USB sticks or memory cards as well as on paper. Paper images are easily scanned and then displayed in the frame. You will hardly find more clarity buying frames then here. On the one hand, you can directly touch the frame as a sample, on the other hand, you can clearly see on the screen what the frame and picture together will look like. If you have generated your dream frame, it will be ordered afterwards. Payment is either by credit card or cash at the desk. Throughout the selection and ordering process, the experienced McRahmen employees are available to answer further questions. Other services such as framing pictures in the finished frame are also available on site. The ordered frames can be picked up either directly at McRahmen.de or be delivered to the your front door. For this new concept Artvera was able to win an excellent selection of quality manufacturers. At McRahmen.de, in addition to the well-known wooden frames by Aicham Larson-Juhl, picture frames by Roggenkamp or DEHA Design are also available. Aluminium frames by Nielsen are represented as well as frames by effect, Walther or Accent. As a longtime online retailer, we have belong in the meantime to the leaders on the online frames selling market. We sell frames by over 40 different manufacturers in different shops, almost all well-known brands are represented by us. We deliver the frames not only nationwide, but also internationally. For example, we have our own shops for customers in Austria, Switzerland, the Czech Republic and the Netherlands. We also deliver regularly to the UK, France, Italy and Denmark. Deliveries in all countries are on principle available by request. With McArt we offer digital prints of excellent quality and disose of a database of up to 5,000 images and photos. We not only print our image on canvas, special paper or adhesive foil but cut the passe-partout and frame your image directly. This means you can have everything from printing to framing at one spot. Thanks to a modern computer software related passe-partout cutter we are able to fulfill nearly every wish in a perfect quality: Individual and various cut-out forms, different layers of distinct passe-partout cardboard, cuts with marks and different decorations as well as printing phrases such as names and places. 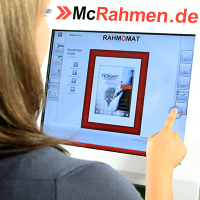 Our McCut passepartout service can be found on www.AllesRahmen.de. In unserer McRahmen.de Filiale bieten wir über erfahrene und kompetente Bildeinrahmer/in, in deren Händen ist Ihr Bild buchstäblich in besten Händen. Wir rahmen Bilder, kaschieren Bilder und spannen Leinwandbilder auf Keilrahmen.